For the second time, the ERA-NET PathoGenoMics has recognised outstanding PhD theses in the field of pathogenomics research. The annual prize is endowed with 2000 Euros for each winner. This year, three reseachers have been chosen from a total of ten applications: Christel Archambaud (France), Cédric Delevoye (France) and Joâo Paulo dos Santos Gomes (Portugal). The official award ceremony took place during the 3rd European Conference on Procaryotic Genomics in Göttingen, Germany, on 8 October. Following an introduction by Nicole Firnberg (Austria), the winning researchers had the opportunity to present the results of their thesis. 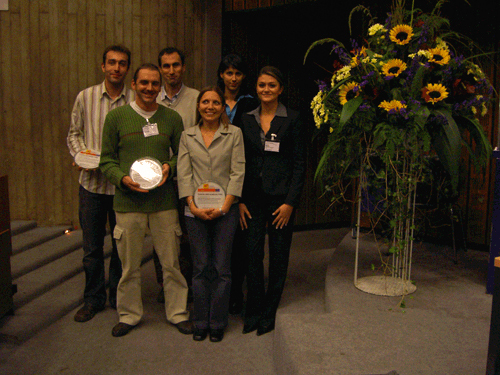 The researchers were later presented with their awards by the French scientist Philippe Glaser (Institute Pasteur, Paris): a large petri dish with synthetic resin as imitation agar, through which the official award certificate can be seen, as well as a hard copy of the certificate rolled in a volumetric flask. Christel Archambaud (3rd from right) from the Institut Pasteur in Paris has focused on the analysis of a special enzyme family involved in signal transduction (phosphatases) and its role in the pathogenicity of Listeria monocytogetes, which can cause a number of deadly infections due to its sophisticated survival and reproduction strategy once it has entered a host. In her PhD thesis, Archambaud has identified a functional phosphatase (Stp) that appears to be crucial for the virulence of Listeria. Cédric Delevoye (1st from left), working at the Institute Curie in Paris, has analysed the intracellular infection cycle of Chlamydia. Chlamydia is a sneaky bacterial genus that can only reproduce from within host cells and causes chronic infections that are extremely difficult or impossible to treat. In his PhD thesis, Delevoye focussed on identifying membrane proteins that are secreted by Chlamydia pneumoniae during infection. In addition, he functionally characterised a single protein from the IncA-family that appears to be essential for cellular membrane fusion events. Joâo Paulo dos Santos Gomes (2nd from left), working at the National Institute of Health in Lisbon, studied biological and genetic features of Chlamydia trachomatis serological variants to reveal their different pathogenic potential. Dos Santos Gomes identified highly polymorphic so-called pmp genes as playing a significant role in infection and transmission ability based on transcriptomic and immunoactivity analysis. Furthermore, he found recombination among strains to be a mechanism for generating Chlamydia trachomatis diversity.